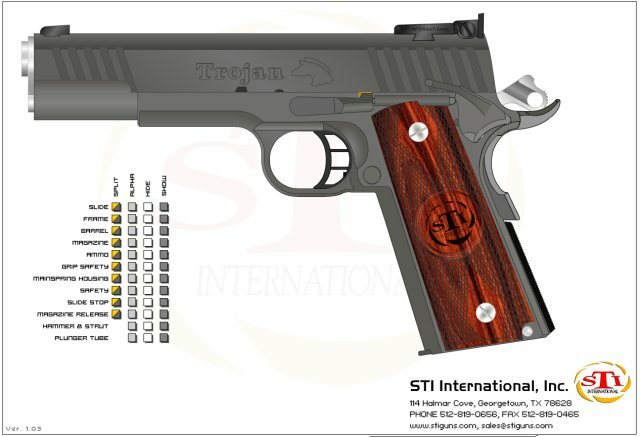 Here is the most amazing tool you can find, to help you understand exactly how the 1911 pistol works. This animation, is the kind offer of Dave Skinner, the owner of STI. Click on the image below, an animation will be loaded. Use the check boxes in the menu, on the lower left part of the animation, to hide/unhide the various parts, of the pistol, while you watch it cycle, so you can focus on that particular part you want. For example, you can hide the slide to see how the barrel unlinks from the slide and cams down, for the ejection and reloading. Other options include spliting the part or Alpha-ing the part. Experiment to see the various effects. Click on "Show" to show that part again normally. You may also change the background color from white to black, hide or show the parts selection menu and specify if the pistol will use a normal guide rod or STI's Recoil Master. This is done by slowly sliding your cursor, towards the lower left side of the screen. You may also download this screensaver, which contains the above-mentioned animation. Save that in your PC, and have it installed. Then when you do not do anything on your computer, that animation will come up, showing you in amazing detail, how the pistol works. I would like to thank Dave Skinner, for allowing M1911.ORG to use this terrific tool.